Even though my youngest little munchkin is now a sturdy eight year old, I can still remember the thrill and excitement of each new pregnancy declaration. I only wish I had known, for all of my kiddos, what I know now, about giving babies the healthiest start possible. Note from Cara: This is a guest post by Melanie of Honest Body. We love her guest posts here! 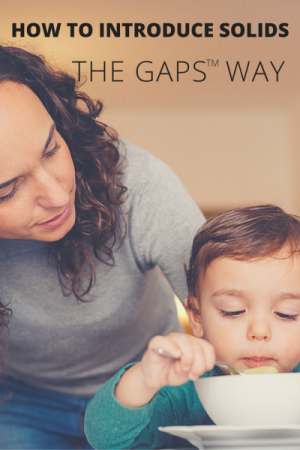 She is a knowledgeable mother who has incorporated the GAPS diet in her own family. 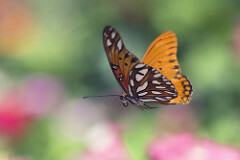 She is a wealth of information and an all-around lovely lady. Not mess up their little digestive systems (SO important!) by introducing dead and commercially prepared “baby” foods, and hard-to-digest “baby” cereals. Feed them very-easy-to-digest foods, and brain building foods like fats and egg yolks. The ever practical and generous, Dr. Natasha Campbell-McBride, has laid out a systematic and healthy way to introduce solids to your baby, in a way that listens to their individual signs and bio-individuality, and gives them high levels of nutrients and little-body-building foods. 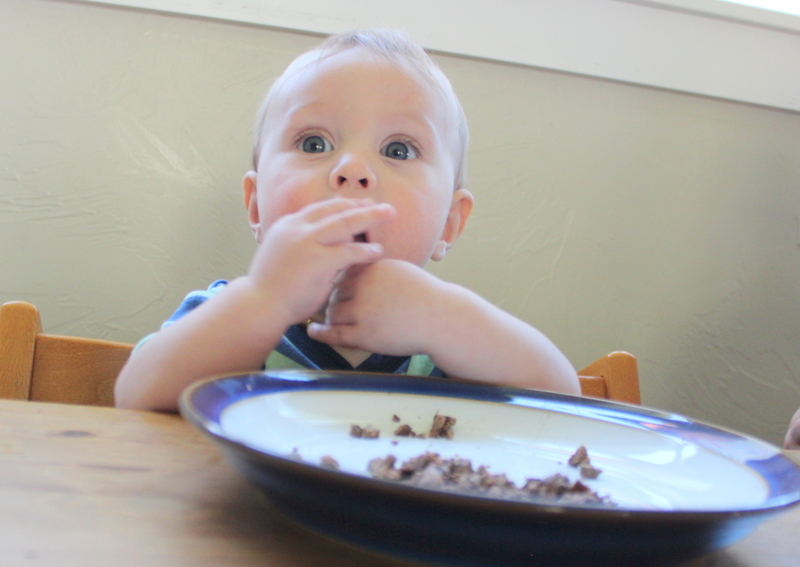 Let’s tuck into this project of introducing solids to your little one. 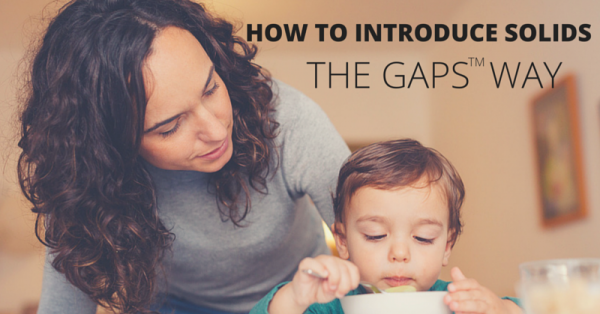 Before we get into the details of the solids progression, Dr. Natasha Campbell-McBride recommends two different introduction starting points, depending on whether baby is bottle-fed, or breastfed. FIRST – Do the Skin Sensitivity Test! For older clients I often consider food sensitivity testing, like the MRT Leap 150, but for the little folks I recommend to use Dr. Natasha’s method for skin sensitivity testing. Dr. Natasha recommends doing the skin test before each new food. So what does the skin test look like? *Note: Test the food in the intended form of eating…if testing raw egg yolk, make sure you put raw egg yolk on baby’s wrist, not the whole egg, or cooked egg. *Another indication that a food is “too much, too fast” for your baby, is if the stool changes to either diarrhea or constipation…or if a new skin rash or eczema flares up. 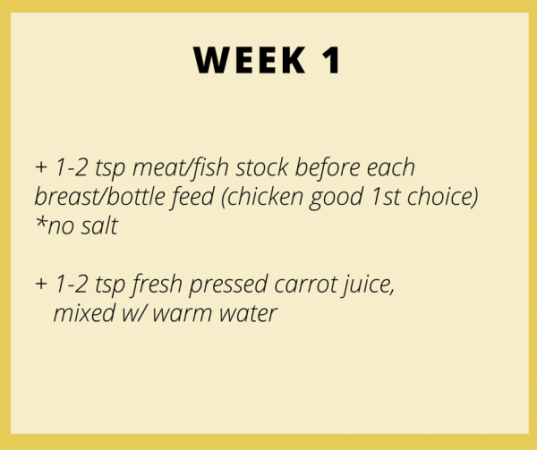 The main emphasis of week one is introducing meat stock & fresh pressed carrot juice. 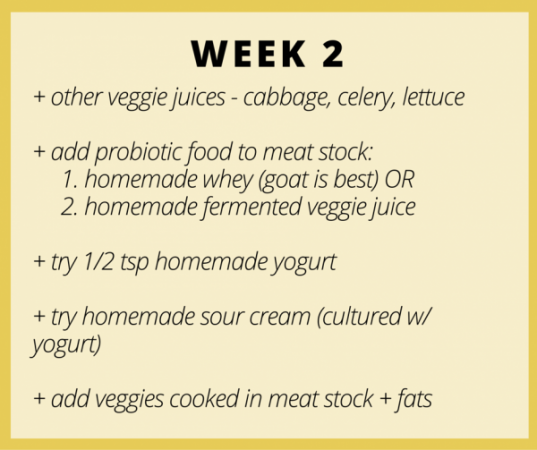 This is a big week :) The main emphasis of week two is increasing veggies in the fresh pressed juice, introducing probiotic vegetable juices to the meat stock, and then adding cooked vegetables and more fats. Use non-starchy, peeled, seeded vegetables such as — carrots, squashes, leeks, onions, garlic, broccoli, cauliflower, & zucchini. When veggie puree has cooled down, add 1 tsp. of homemade, organic yogurt. Start with 2 – 4 tsp. of veggie soup/puree a day. Gradually increase thickness from “soupy” to “puree”. 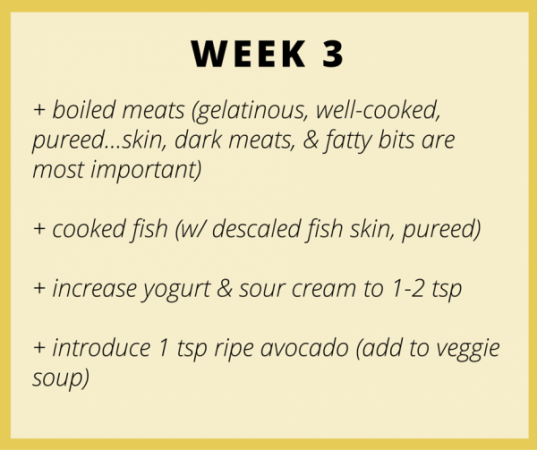 The main emphasis of week three is adding solid meats & fish, and mashed avocado. Start with a small amount of chicken and include the soft bits, the fatty parts, the dark meat, & the skin. Then try other meats as well as fish. Fish is important and it is incredibly nutritious to add the de-scaled fish skin to the solid fish meat. Continue adding 1 tsp of fermented veggie juice to soups/purees. 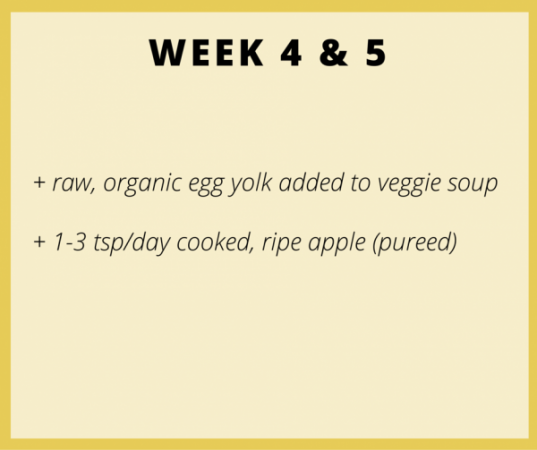 The main emphasis of these two weeks is adding raw, organic egg yolk and cooked, ripe apple. Give this step a little time and watch for any reactions beyond the skin sensitivity test…such as stool changes or skin rashes. Simply stew peeled, cored apples (that are ripe) in water until soft. This puree can be refrigerated for a week, or frozen, but should be warmed to body temperature for feeding to your baby. Start with a few tsp. of apple puree a day, and watch carefully for stool changes or skin reactions. Don’t warm up in the microwave! 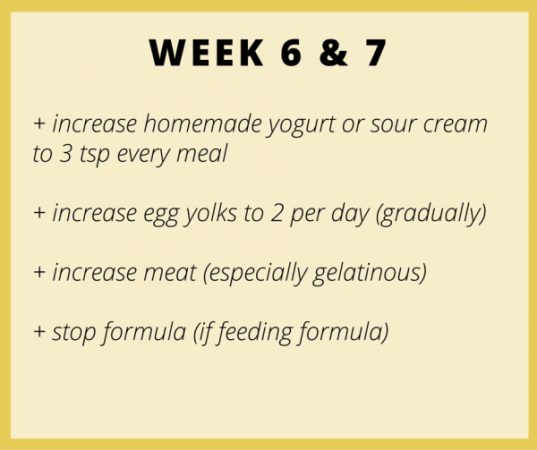 The main emphasis of these two weeks is increasing previous foods, and to discontinue formula if baby is formula fed. You can also add the yogurt or sour cream to the fresh pressed juices or water in a bottle. 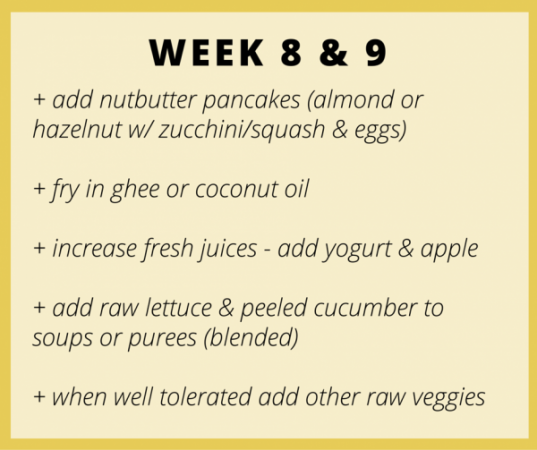 The main emphasis of these two weeks is adding nutbutter pancakes and raw vegetables. This is a fun week! After these two veggies are tolerated well you can slowly add other veggies, prepared in the same way — carrot, celery, cabbage, bell pepper, kohlrabi, etc. 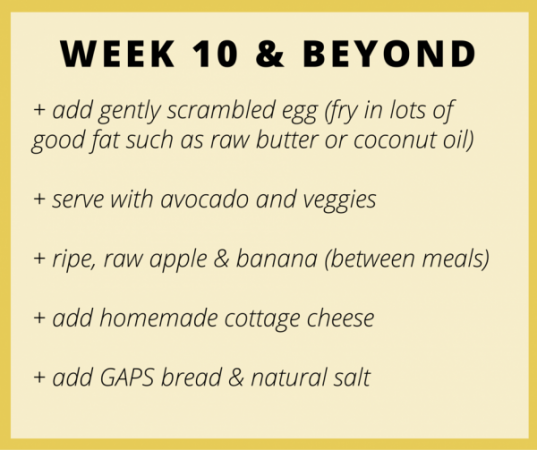 The main emphasis of this week is adding scrambled eggs, raw apple, and raw, ripe banana. Cook the egg gently, serving just a tiny bit, and serving with avocado or veggies. *Feed your baby fruit between meals as a snack. To make cottage cheese you can gently heat a bowl of yogurt in a larger bowl of hot water, until it separates into curds & whey. Then put the curds & whey into cheese cloth (tying the ends up) and let it drip for 8 hours over a bowl. The cheesecloth can be tied to a wooden spoon and suspended over the bowl that way. No more separate cooking for baby at this point! In this section I will bullet point key points to remember while doing this 10 week progression. Always do the sensitivity test before each new food! This will eliminate a lot of guesswork later. It is important to introduce and increase foods gradually over time. Carry on with previous safe foods, as you add new foods. You don’t have to do every food if there is a sensitivity. Some foods can be retried later. Give the breast only as a reward, after baby has eaten their meat stock. DO NOT use commercial stock or bouillon cubes/paste! Keep the fat in your homemade stocks. DO NOT use commercial vegetable or fruit juices…they must be fresh pressed at home. Work with two spoons, one for your baby to practice or play with, and one for you to feed them. This is all over soooo quickly…enjoy it! I hope this information helps with your own feeding and care of our baby. Take time to soak up these days and weeks…they are over too quickly, and what you do now will have a big impact on your little munchkin’s health for a long time to come. the only reason I didn’t do this diet with my baby was because i read that if the breastfeeding mother wasn’t eating GAPS then there wasn’t a point to introducing solids the GAPS way mentioned above. unfortunately I do not remember my source, but could you comment on this please? Thanks for this super helpful post! Based on the previous comment and response, I’m wondering if there is a reason to be on GAPS if there aren’t health concerns for Mom or baby? In other words, if Mom is eating a healthful diet that includes grains and dairy prior to and throughout pregnancy, birth and early breastfeeding, without any reactions in baby, is there a reason to change Mom’s diet? Should expectant mothers simply be on GAPS as a matter of course?